Home / news / president duterte / senator alan peter cayetano / senator leila de lima / Should De Lima inhibit herself from Senate probe on EJKs? "I am thinking of drafting a letter asking Senator De Lima to inhibit herself from the hearing kasi may pre-judgment na siya. Makikita mo sa kanya, lahat ng namatay, summary killing na o extrajudicial killing na. As a [chairperson] kasi, makikita mo everytime magsalita siya... may judgment na eh... Ang sinasabi ko naman, hindi dapat ang chairman [ang] bias. Twenty-four senators [kami]. Why not allow someone who is less polluted, less biased to do the investigation?" Cayetano said he is reviewing the transcript of the hearing to establish De Lima's bias on the issue. The Senate justice committee headed by De Lima is conducting the inquiry on EJKs along with the Senate committee on public order and dangerous drugs. Many accused the neophyte senator of using the probe to weaken the Duterte administration's war against illegal drugs. Prior to even receiving Cayetano's letter, De Lima has already told media that she will not inhibit from the probe. 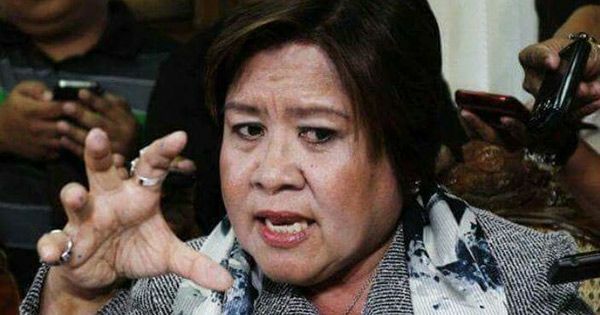 "I am not gonna base that [on] the opinion of someone who has evidently been the defender or the apologist of the president in the Senate," De Lima said. "Sino ba biased sa amin? Siya nga very biased in favor of the administration and EJKs from Day 1 of the hearing." De Lima said she would rather let the public judge her on whether or not she has been biased. This means that a public clamor is needed to restrain her from leading the probe. Do you want De Lima to inhibit herself from the Senate inquiry on EJKs?